Although protection for the Turneffe Atoll had been discussed for more than 20 years, and its importance has been identified in all national Gap analyses, Turneffe remained without management or protection until 2012 when the Turneffe Atoll Marine Reserve was declared. Sustainable management of Turneffe Atoll was first officially addressed in the early 1990's when the "Turneffe Islands Committee" was established to help protect the atolls fragile environment and the rights of customary users. This Committee intended to allot portions of the atoll for different uses; however, this process was never initiated. In 1994, the management of Turneffe was emphasized by the three ministries principally responsible for developing the Coastal Zone Authority and Administration; Fisheries, Environment and Tourism. 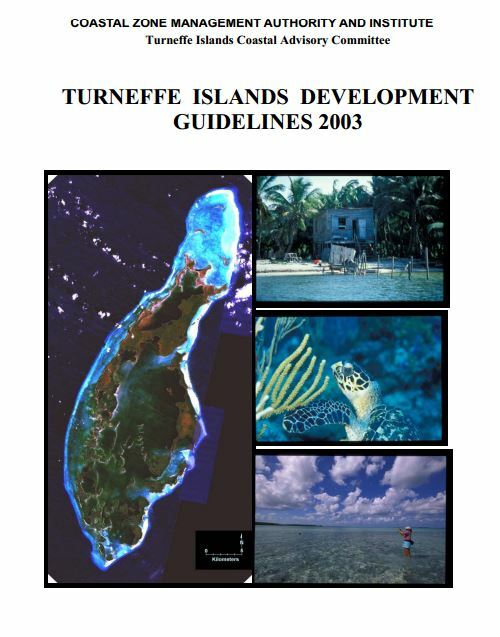 In 1996, John Gill et al drafted the Turneffe Islands Development Guidelines, a set of comprehensive recommendations for each of 94 sites around the atoll. The Coastal Zone Management Act was passed in 1998 calling for the development of a Coastal Zone Management Plan for Belize and Turneffe Atoll was proposed as an area in need of planning. The first phase of of this plan was passed into law in 2001 and the coastal areas of Belize was divided into nine planning regions, including Turneffe. In 2001, The Turneffe Islands Coastal Advisory Committee (TICAC) held it's initial meeting and over the following two and one-half years the Committee developed the The Turneffe Islands Development Guidelines, which were completed in 2003. These Development Guidelines included a detailed land tenure analysis, multiple maps, specific recommendations about dredging, over-the-water development, Turneffe's unique and special areas and Provisional Development Site Tables based largely on John Gill's prior recommendations. Like the 1996 guidelines, these guidelines were never adopted and the Turneffe Islands Coastal Advisory Committee remained dormant for several years. In October, 2010 with the revitalization of Coastal Zone, TICAC was reformed and and renamed the Turneffe Atoll Coastal Advisory Committee (TACAC) in line with the proper name of the atoll. Several changes had taken place since the drafting of the first set of Development Guidelines including large scale shifts in land ownership from national land to the private sector and the establishment of a University of Belize's research station and the Belize Coast Guard Station at Calabash Caye. Nine regional Coastal Zone Committees, including TACAC were formed to, once again, develop recommendations for Turneffe. 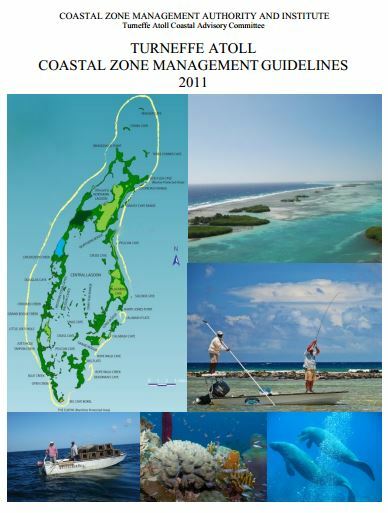 The Turneffe Atoll Management Guidelines,which drew heavily from the 2003 guidelines, were completed in 2011. To establish an official organization to represent the stakeholders of the Atoll. Establishing Turneffe Atoll as a Marine Reserve was identified as crucial to this process from a very early stage and efforts between 2010 and 2013 were directed towards this goal. Financing was provided by Turneffe Atoll Trust largely through the assistance of the Oak Foundation. Stakeholders of Turneffe Atoll are a diverse and multi-talented group offering a wide range of skills and capacities crucial to the effective management of the Reserve. Their collective goal was the establishment and operation of a marine reserve that would act as a model for all marine reserves in Belize, the region and the world. The Reserve was expected to be economically and environmental sustainability while providing sustainable economic and social benefits for its stakeholder community. Over the next two-three years, the process to declare Turneffe Atoll a Marine Reserve was an arduous process involving more than 10,000 man hours of consultation. It came about through the hard work and commitment of Turneffe’s stakeholders including its fishermen, resort owners, the University of Belize, the Belize Coastguard and private landowners. Tourists also helped through monetary contributions. The major output of the stakeholder consultations, which were guided by The Nature Conservancy through their Conservation Evaluation Process was the Turneffe Atoll Marine Reserve Management Plan for Turneffe Atoll. This plan has been hailed by most experts as the most comprehensive protect area Management Plan in Belize. By the end of 2011 a very strong case had been made for protection of Turneffe Atoll. 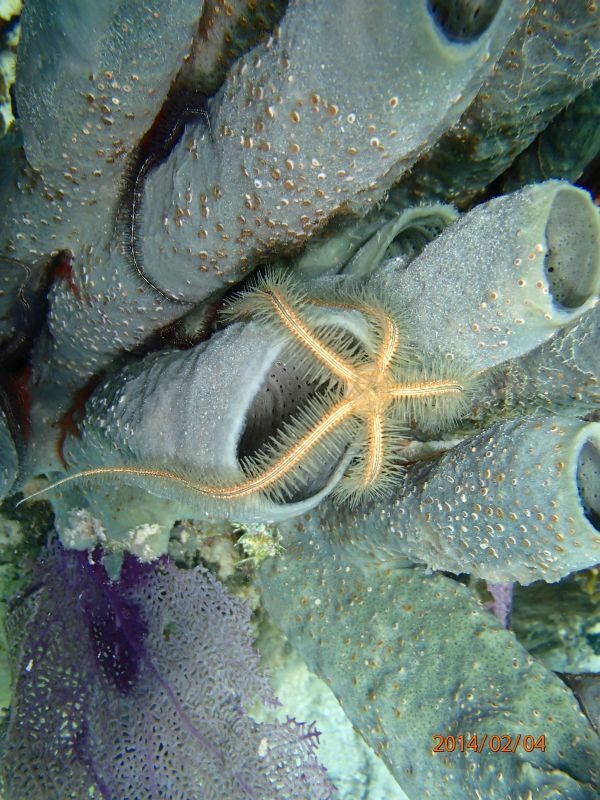 However, there remained two major hurdles to its designation as a Marine Reserve. One was the need for a senior figure within Government to champion the cause of Turneffe as a national priority. The second was financial sustainability; Belize has a great network of Marine Protected Areas but it is heavily dependent on international donors, because funding from entry fees and Government is insufficient. The first hurdle was overcome by the appointment in March 2012 of Lisel Alamilla as Minister of Forestry, Fisheries and Sustainable Development. In her first few months in office, she took the time to learn about Turneffe, became convinced of its importance, and turned to BLUE Marine Foundation for help on the financing challenge. Alerted by the ecotourism expert, Costas Christ, BLUE had quickly grasped both the value of Turneffe and the potential for the financial barrier to be overcome by bringing The Bertarelli Foundation to the table. BLUE engaged its close associate Fauna & Flora International to undertake a short scoping study, which highlighted the opportunity to invest in conserving globally important marine biodiversity and enabling sustainable development. The report confirmed the strength of the planning and preparation already undertaken, and focused its recommendations on investment in the financial and institutional sustainability of the proposed Reserve, as part of the national protected area system. With the scoping study findings in hand, BLUE was able to facilitate an understanding between the Government and The Bertarelli Foundation that, if the Ministry were to go ahead with its intention to designate the Marine Reserve, then the Foundation stood ready to provide the financial support necessary to make Turneffe Atoll a successful, sustainable Marine Protected Area. The way ahead was now clear, the Minister announced publicly the Government’s intention to protect Turneffe. In November, 2012, the Turneffe Atoll Marine Reserve was officially declared by Minster Lisel Alamilla, Minister of Fisheries, Forestry and Sustainable Development and the Government of Belize through Statutory Instrument 111 of 2012. Various management models have been used for Belize’s protected areas, but the most successful have involved co-management arrangements with organizations involving stakeholders at all levels of management. This has provided both incentives and opportunities for all stakeholders, especially the fishing stakeholders. The co-management structure in Belize has been recognized nationally, regionally and internationally. After careful consideration, Minister Alamilla elected to move forward with establishing a co-management arrangement for Turneffe Atoll Marine Reserve. Although stakeholder involvement is a key element for the success, this alone does not ensure quality management of a marine reserve. In addition, quality management for Protected Areas requires a Board of Directors with the skill, talents and interests required to make informed, relevant decisions for the good of the protected area. An effective Board of Directors for Turneffe Atoll Marine Reserve required a blend of individuals with a comprehensive understanding of, and absolute commitment to, meeting the challenges of managing The Turneffe Atoll Marine Reserve. An understanding of the scientific and socio-economic issues of the Atoll as well as the complex logistics related to Turneffe with essential. This required a strong representation from the atoll's key stakeholder groups. Although local perspectives must form the basis for Board decisions, an international perspective is often valuable. A Board with both local and international perspectives offers the best of both worlds allowing for more informed decisions. With these goals in mind, the Turneffe Atoll Sustainability Association (TASA) was formed as a Belizean NGO for the sole purpose of co-managing the Reserve. TASA's Board of Directors includes two representative from the fishing community, 2 representatives from Turneffe's tourism sector, 1 representative from the University of Belize, 1 from Turneffe Atoll Trust, 1 marine science expert and 1 Turneffe Atoll private land owner. The Fisheries Administrator and The Executive Director of TASA were suggested as ex-officio members. On October 2013, Turneffe Atoll Sustainability Association, Co-Management Agreement was signed between the Government of Belize represented by the Fisheries Department "The Regulatory Agency" and Turneffe Atoll Sustainability Association "The Manager".